Standard End Sections give round or arched pipe a completed, finished look and do not require a 3:1 or a 6:1 sloped embankment. When used on the pipe inlet, these ends help prevent soil erosion that often occurs in creeks, gullies, and ditches. Agricultural producers prefer end sections on field drainage pipes because soil can be retained in the field rather than at the bottom of a drainage ditch. 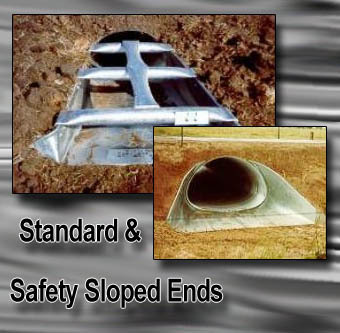 Safety Sloped End Sections meet DOT requirements for both 3:1 and 6:1 embankments and are available in parallel bar or cross bar construction. These ends will attach to smooth wall, concrete, or corrugated pipe and are a reliable alternative to concrete end sections.